This news item was posted in L, Liver category and has 0 Comments so far. When diagnosing liver disease, the physician looks at the patient’s symptoms and conducts a physical examination. In addition, the physician may request a liver biopsy, liver function tests, an ultrasound, or a CT scan (computerized tomography scan). Jaundice is a yellow discoloration of the skin and eye whites due to abnormally high levels of bilirubin (bile pigment) in the bloodstream. Urine is usually dark because of the bilirubin excreted through the kidneys. High levels of bilirubin may be attributed to inflammation or other abnormalities of the liver cells or blockage of the bile ducts. Sometimes jaundice is caused by the breakdown of a large number of red blood cells, which can occur in newborns. Jaundice is usually the first sign, and sometimes the only sign, of liver disease. Ascites can also be caused by non-liver disorders. Liver encephalopathy is the deterioration of brain function due to toxic substances building up in the blood, which are normally removed by the liver. Liver encephalopathy is also called portal-systemic encephalopathy, hepatic encephalopathy, or hepatic coma. Liver failure is severe deterioration of liver function. 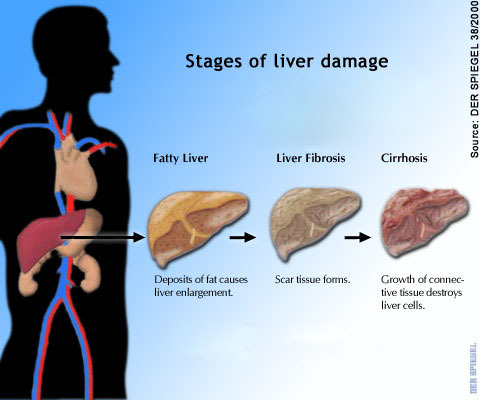 Liver failure occurs when a large portion of the liver is damaged due to any type of liver disorder.